flossyblossy: Happy new Year and i hope 2010 is good one for you all! Happy new Year and i hope 2010 is good one for you all! I didn’t actually mean to go AWOL over Christmas but blogging was soon replaced by eating Fruit and nut Toblerone and guzzling advocaat! I broke up from work on Christmas Eve and i was really ready for a few days of pottering around and just doing a bit of what i fancied, when i fancied. It was bliss. And, i even won a prize over there too. A threadcatcher/Pincushion make By Krista! 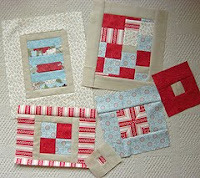 And i did do some more work on this so i think i have 20 blocks done now! 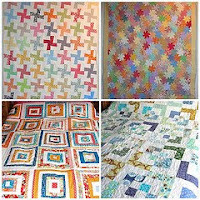 January is likely to be a very busy month as I’ve set myself the task of making quilts for 3 birthdays at the end of January so it’s looking doubtful that I’ll even get the rest of the UFOs all done by the end of this month. Getting sidetracked by my new 22 degree wedge ruler for dresden plates is NOT going to help! Has it really being two weeks?